^ Moore, Carrie A. What's changed at Tabernacle?. Deseret Morning News. 27 March 2007 [28 January 2010]. 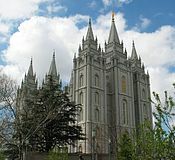 C. Mark Hamilton, The Salt Lake Temple: A Monument to a People (1983).